It is very important to collect data about rainfall. This data is critical for the scientific community in developing an understanding of the local, regional national and global climate. Just as important, collecting this data over the course of years will help in the study of climate change, global warming, and a host of other issues. Besides the scientific value, rainfall data is very important for the agricultural community. Seasonal rainfall information is used for deciding when certain crops should be planted or harvested, and even which type of crop, or variety of crop should be chosen for that season. The amount of rainfall will also be one of the variables in determining the amount of growth of various grazing crops. This information is used by the farmer in making economic decisions as to the type of feed used for animals, and even the expected costs for raising these animals. Rainfall data is also a public health and safety issue. There are many areas that are periodically subject to drought conditions. Measurement of rainfall is used to help understand if those conditions are in effect, and their severity. Various public regulations pertaining to water usage, such as lawn watering, car washing, etc., can be set by knowing this data. In times of very high rainfall, potential flood conditions can be predicted by good rainfall measurement techniques. Devices to measure rainfall have been available for many years. One of the most primitive types is simply an open cylinder. The rain collects in the cylinder over time. The measurements may be recorded by someone who travels to all of the collection sites and notes the level within the cylinder. Generally, the cylinder will be emptied at that time, so that it can collect a new sample. Of course there are many significant sources of error in this method. There will be a certain amount of natural evaporation. If precipitation is in the form of snow or sleet, it may block the entry to the cylinder. There is also considerable effort required to record these readings, and it is important to collect these readings before the cylinder may overflow. Another type of device is known as a tipping gage. A collection container is attached, in an unstable method, to a frame with a pivoting connection. The container will simply collect the rain, until the weight of the rain causes the container to tip on its pivot. It will tip over, empty it’s contents, and advance a counter which measures the number of times that it has tipped. By knowing the amount of weight that will cause a tip to occur, and seeing the number of times it has tipped, the total amount of precipitation will be know. A much better method of recording rainfall is by using a rain gage scale. A container sits on the platform of an accurate electronic scale. Generally, there is also an electronic output from the scale which can be sent to a chart recorder or other recording device. This allows very accurate measurement of precipitation, and also records the time and date of that precipitation. Because rain gage scales are often located in remote locations, they must often have to operate on battery power. The scale may be designed to consume very low power, but this will often interfere with its accuracy. Another power saving technique is for the scale to turn itself on and off on a timed basis. For example, it may turn itself on for only 1 second every minute. This can allow enough time for an accurate reading, but will reduce the power consumption by a factor of 60. Of course, if it only turned on once in ten minutes, the power consumption would now be reduced by a factor of 600, offering much longer battery life. The components of the scale must be designed to operate for long periods of time in difficult, outdoor environments. 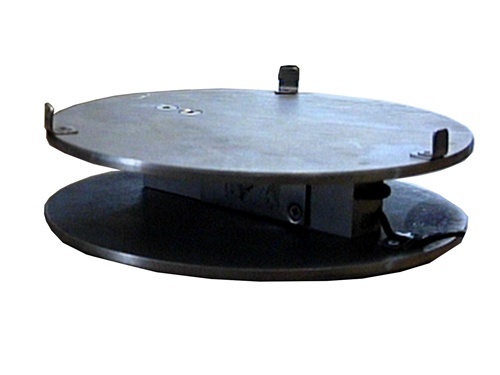 The scales load sensor is the most prone to damage by moisture and extremes of temperature. While aluminum is the most common material used for scale load cells, the highest quality scales, such as those offered by Arlyn Scales, use stainless steel for the load cell. Besides providing much lower opportunities for corrosion, stainless steel is also much more rugged. In all cases, the load cells and the entire scale must have excellent temperature correction capability. While most scales are designed to be used within an industrial or laboratory environment, rain gage scales are subject to very wide ranges of temperature.